We had never undertaken an IT development project of this magnitude. We knew we were going to need a lot of education, hand holding, and other support. Over the year-long project we received that support over and over, many times through in-person meetings. When we interviewed IT firms, we felt that Mightybytes was as passionate about creating CureAccelerator™ as we were. We believed that passion would help us overcome the challenges we knew were ahead, and we were right. Here’s how Mightybytes helped a local healthcare startup improve access to treatment alternatives for people with rare diseases. Eight percent of the world’s population has a life-changing disease for which there is no universally effective therapy. 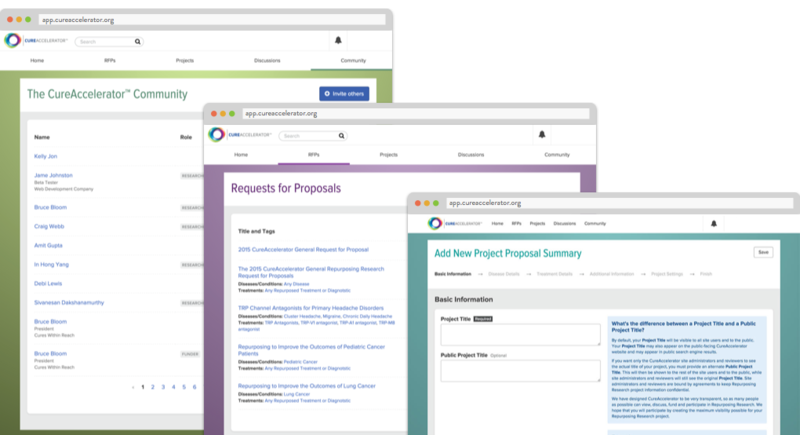 Cures Within Reach, the philanthropic leader in healthcare repurposing research, sought to build a collaborative web portal where researchers, clinicians, and funders could author shared, peer-reviewed documents to develop low-cost treatment alternatives for patients with rare diseases. Low-fidelity experience mapping in a workshop. We started this project with multiple discovery workshops to define target audiences and to translate researchers’ existing offline workflows to an online equivalent with the ability to handle a scalable expansion of capacity. We provided design, content, user experience, data modeling and back-end programming services delivered through two-week sprints utilizing agile methods. After creating high fidelity wireframes, a style guide informs the general design. 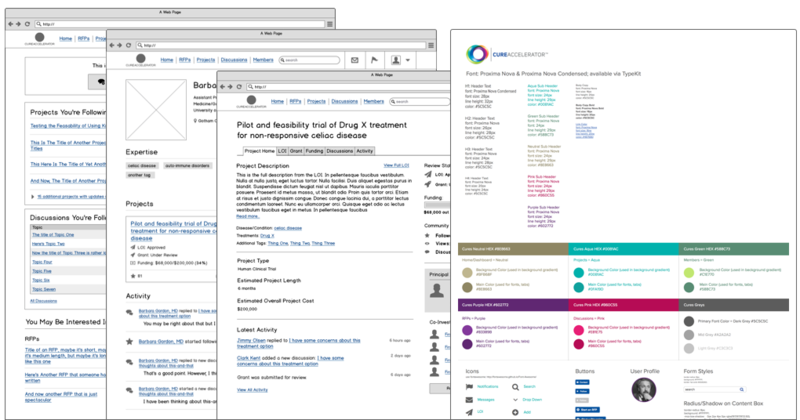 This complex portal was built with Laravel and accompanied by an intuitive front-end design that made it easy for users to collaborate on drug research projects. In order to get a working prototype in front of users as quickly as possible, we developed a beta website to gather feedback early in the development process. As we rolled out features, we polled users to help prioritize feature enhancements. CWR’s initial goal was to have five researcher-clinician matches by the end of their first year. By the end of the beta launch, there were six matches — with another seven months to go! Final screen designs for various portal sections.